Which Way Will Solar Energy Go? Life in the solar energy business is a constant battle between soaring aspirations for long term growth juxtaposed against the terrifying reality of falling prices and global competition. Selling more might actually mean your solar energy business will just lose more money faster. There is, of course, more than one solar energy business. There is the photovoltaic panel (PV) business dominated by low price Chinese exports. Then there is the utility-scale solar energy business segment where US and European players have a good foothold but not a sure lead. The PV business is rapidly being commoditized and plays well to China‘s strengths in low cost manufacturing for export. The Concentrating Solar Power (CSP) and other utility-scale variations play toward the central station generation business model upon which utilities are built but offers more technology risk. When you hear about the solar energy business much of the discussion is about the PV segment. The hottest markets for solar energy were often over stimulated by feed-in-tariffs that promised attractive revenue. That stimulus brought new entrants often with lower prices on PV panels made in China than the domestic PV producers in Spain, Germany, and other EU and US markets could match. After every boom there always and everywhere is a bust in such volatile markets. The bust accelerated as the payouts from feed-in-tariffs swamped the budgets of governments that promised them in a booming economy and could not sustain them in a recessionary one. EU PV panel producers dumped product on the market at fire sale prices in an effort to survive. The combination of China’s acceleration of low cost panel production to keep its exports growing and the glut of panels from struggling PV producers in EU and US and left the global solar energy business where it is today—a global market full of potential, oversupplied with a glut of product and with many players left to catch the falling knives of falling prices. I wrote about the Evergreen Solar struggle and then bankruptcy on the rocks of falling prices. At the end its debt levels were roughly equal to its market cap and its revenue was falling along with prices. But Evergreen is not the only solar player that has failed and it will not be the last by any means in a market that is rapidly consolidating as low price solar panels from China take market share around the world. Government Policy-driven Demand. Demand for renewable energy is being driven by government policy in both the EU and US markets in order to meet emissions reduction goals, achieve renewable portfolio standards set by many US states. Subsidies Subject to Change. The solar industry has learned that feed-in-tariffs that appear to be too good to be true have attracted many new entrants seeking the subsidies and the result has been governments find the goals met quickly and the cost off the subsidies rising too fast to be sustainable. The reduction in FiT in one market sends the solar players looking for better deal in another market. Green Job Promises are Illusive. The politicians often tout green jobs as one of the benefits of the transformation to the clean energy economy, and certainly jobs have been created. But volatility and global market competition has made it tough to hang onto those jobs as the revenue from solar energy growth is often going to China as the producer of choice for low cost solar panels. Commoditization versus Innovation. The drive to survive in the solar energy sector is slowing the learning curve transition to next generation solar technologies. Those who can stay focused on technology innovation have a better chance of long term growth but they also are the most at risk of being acquired by the large global players seeking to position themselves against the low cost Chinese producers. For example, SunPower has been able to drive down its production cost of solar cells from $2.67 per watt in 2007 to $1.20 per watt in 2010 using better technology to improve efficiency and reduce polysilicon costs. But it also sold a big chunk of itself to Total of France to assure its financial base. It is a tribute to the solar industry commitment that none of these risks has stopped the growth of solar energy even in our weakly recovering economy. Solarbuzz reports that the US solar photovoltaic (PV) market will double in 2011, and the US is on track to be the third-largest solar photovoltaic market, behind Germany and Italy in 2011 growing from 5% of the global market today to 12% by 2015. But it is not necessarily innovation that is driving growth. Much of this push is the combination of utility demand for solar energy to meet its renewable energy portfolio standards combined with the industry push to speed projects to capture treasury tax grants before they are scheduled to expire at the end of 2011. It is reasonable to expect continued subsidies based upon the experience to date, but the solar energy industry faces the combined realities that neither the states nor the Federal government have money to burn in this weak economy. The states reaching their RPS goals could declare victory. The Feds facing enormous pressure to cut Federal spending could delay or cut subsidies. Either of these factors would hurt the solar energy industry short-term, but in the long term it realizes it must get to grid parity ASAP to become sustainable. That pressure for lower prices is music to the ears of Chinese exporters and in a consolidating global market they will turn to larger sales and lower prices by bigger global players if that is what it takes to drive out the competition and keep their exports booming. 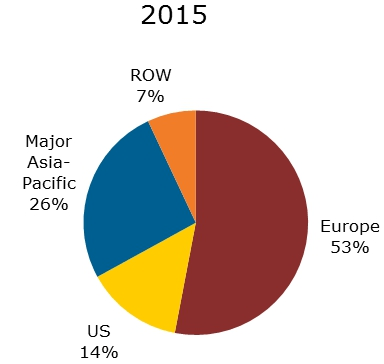 The current battles for market share and global positioning are mere skirmishes in the long war for global dominance in the solar energy industry. That future lies not in the sale of commoditized solar PV panels. That is like selling outdated cell phones at rock bottom prices in a market driven by the lust for the next iPhone model. The Chinese are cleaning up on cheap, early generation commodity PV panels and every buyer of solar energy welcomes their relentless drive for market share because it brings lower prices closer to grid parity. But after the inevitable shake-out of excess players, inventory and the end of unsustainable incentives the real war for solar energy market leadership will begin. It will be driven by better technology bringing higher efficiencies and the software and services that optimize its integration into the solutions we use and the smart grid enabled grid we are building. If utilities remain the primary buyer of large scale solar solutions American and European utility-scale solar energy players can compete and thrive, but they must survive and have a deep pockets corporate parent to win in the absence of subsidies. If the solar energy business goes modular and defaults to PV panels as the technology of choice because it offers scalability, flexibility and less technology risk then the Chinese export potential and low price will have competitive advantages few others can match. This entry was posted in Business Models, Electric Power and tagged China, Evergreen Solar, Feed-in tariff, Grid parity, iPhone, Photovoltaic array, solar energy, United States. Bookmark the permalink.